Generic Colospa is a medicine prescribed to relieve spasm of the gut muscles. It also has a stimulating effect on the motility of the gut and improves defecation. Colospa which contains Mebeverine as the active ingredient is a musculotropic antispasmodic. It is used to treat spasm in irritable bowel syndrome. It acts directly on the smooth muscles of the gut and relaxes them by hindering the nerve impulses that is responsible for the spasm. It also improves peristaltic movement which improves the gut emptying. Protect from heat and light. Store below 300C and keep away from kids. Take it orally with food. Follow the instructions of your doctor. Recommended dose is 100 mg three times a day. However, consult your doctor for the correct dose calculation. 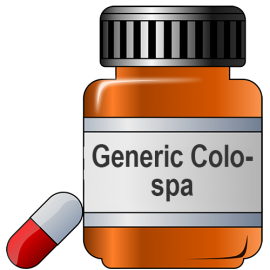 Buy Generic Colospa online at a discounted rate. Consult your doctor in case of an overdose. Use with caution in pregnancy, lactation, renal and liver impairments. It is contraindicated in paralytic ileus. When Generic Colospa should not be used? Do not use if allergic to the drug. It is contraindicated in paralytic ileus. How long should you take Generic Colospa?